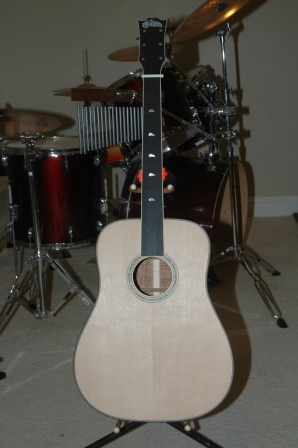 Twas the night before Christmas, and all through the house, the only stirring afoot was the Luthier Mouse. The stockings were hung by the chimney with care, in hopes that St. Neckisloose would soon be there. 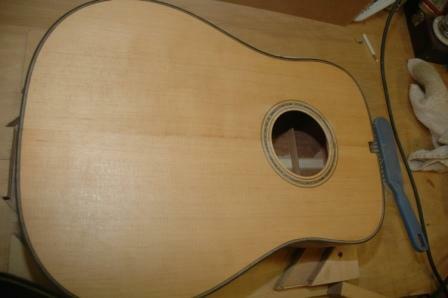 The Luthier trimmed and shaped and made dust in the night, and made all binding and neck cross sections right. 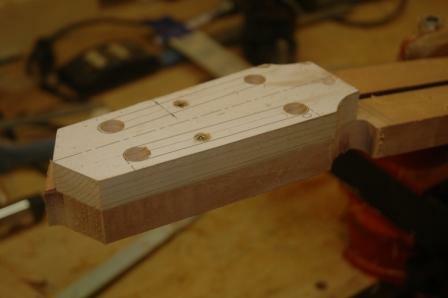 There’s neck joint alignment to do, and a check that the truss rod goes through. Tomorrow will be a day with no dust, hoping that Santa will bring home a 3/4″ purfling muffler bearing. Slow and steady. 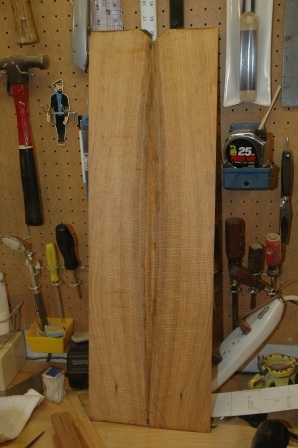 I’m resisting my desire to cut corners and am carefully rasping the neck to shape. 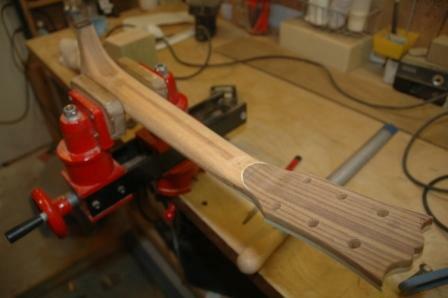 This neck has a veneer plate on the back of the headstock that I need to work carefully to create a clean transition. 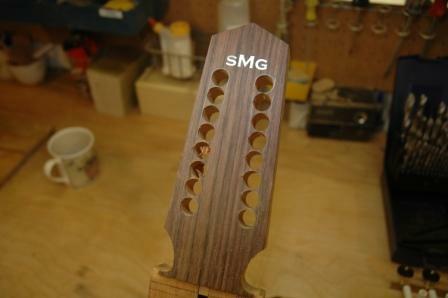 The neck thickness has been etched into the back of the neck at the 1st fret (15.6 mm) and at the 11th fret (23 mm). 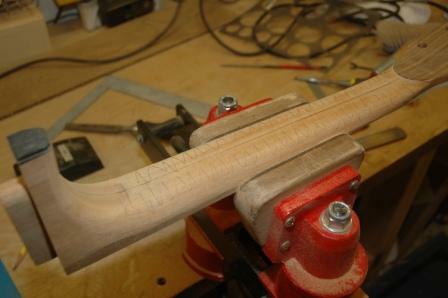 Rasps are used to bring the neck down to the right dimensions and profile. 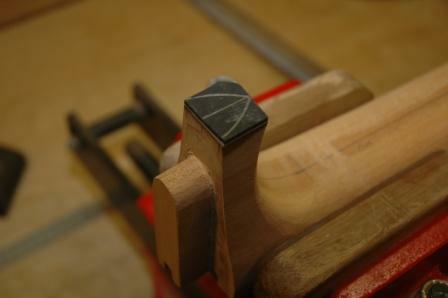 An ebony heel cap has been glued on and the final shape penciled on. 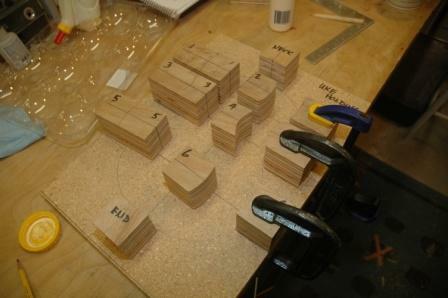 Several more hours of rasping and sanding before the final shape has been achieved. 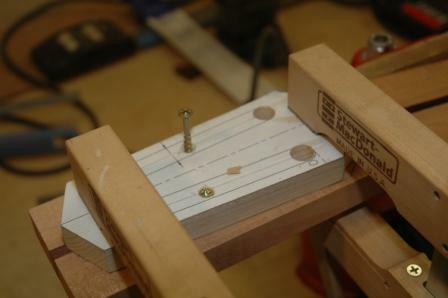 Using the softwood template for shaping the headstock, I first clamped to locate. 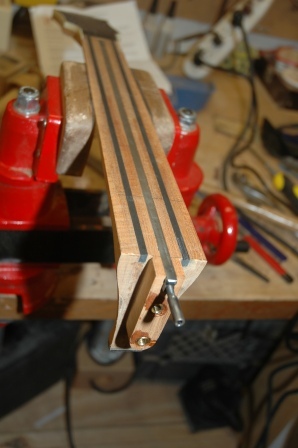 Screws through the tuning machine slots are used to hold the template in place. 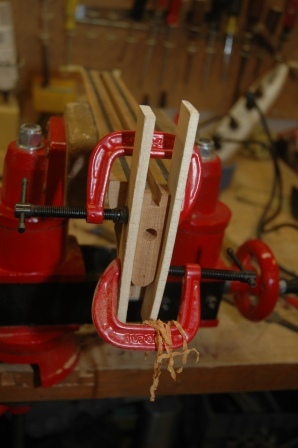 Using a bearing mounted flush cut router bit, the headstock is shaped to the template. 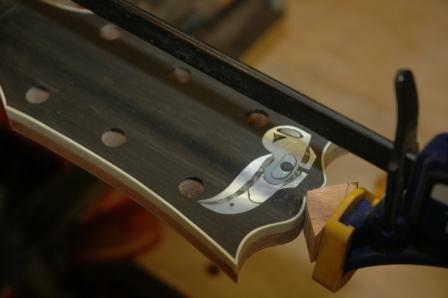 The template is removed, and viola, the headstock is shaped. 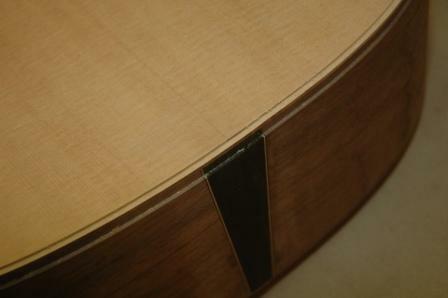 Spent several uninterrupted hours trimming down the binding flush to the body. 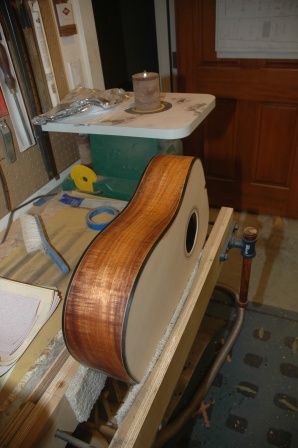 I used an orbital sander to start the finish sanding in preparation for determining the neck angle. The binding and purfling is fit to the body very nicely, and I won’t have any gap repairs. 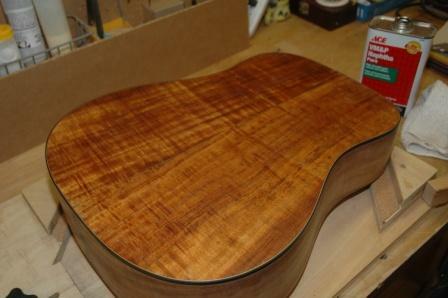 The top was getting a little ragged due to all the handling and the sanding brought it right back to perfect. The back and sides have been cleaned with naptha, which brings out the color and shine that the lacquer finish will provide. The neck angle on a guitar with a radiussed top is not exactly 90 degrees. 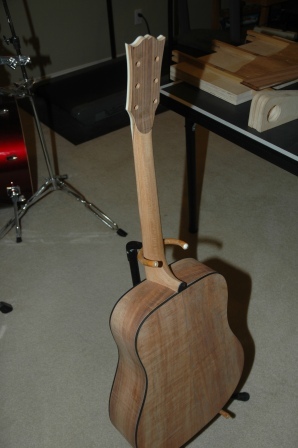 The neck angle needs to be determined to properly route out the tenon on the neck so the fretboard will lie flat on the upper body once attached. 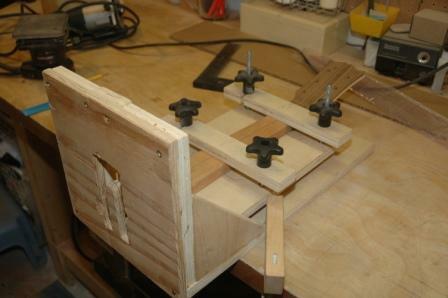 I transfer the measured neck angle to the tenon routing jig and secure the neck into the jig. 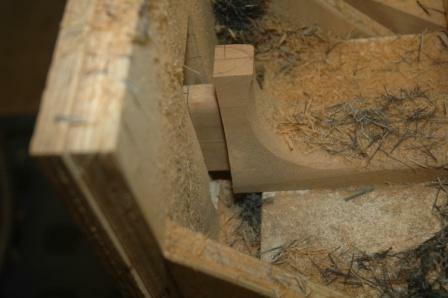 Using a bearing mounted flush cut router bit, I cut the tenon at the proper neck angle out of the neck. 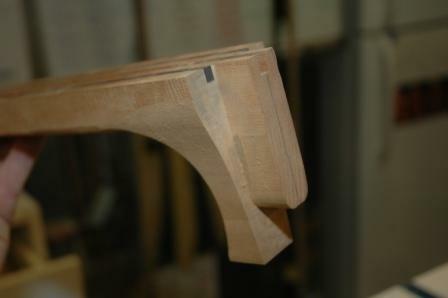 The tenon will need to be trimmed a bit, and any adjustments to the neck angle can be done with a chisel. 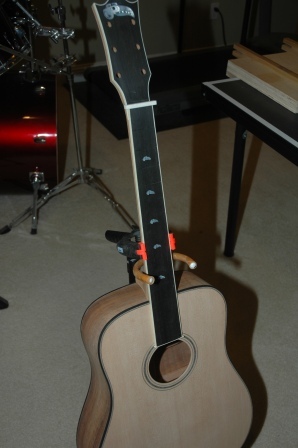 Once the neck set is finalized, I can install the neck bolt inserts and work on the final shaping of the neck. 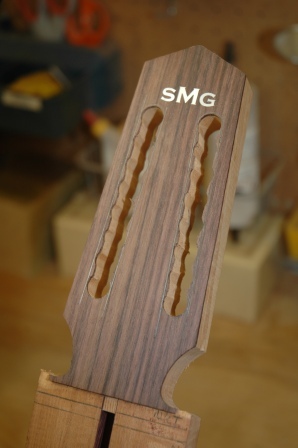 After the first pass of shaping, the fretboard will be glued on, then final shaping, and I can start applying the lacquer. 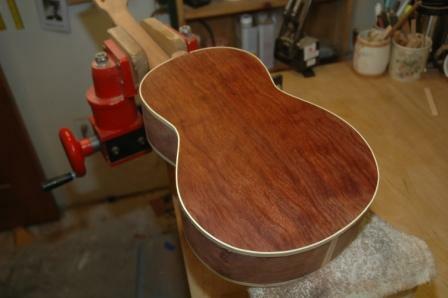 I’ve been working on Guitar 1001 all day, but took a little time to sand down the back of the uke to see how this Bubinga stuff is going to look once finished. Sister Cyndy was in town and she assisted in starting her koa tenor uke. 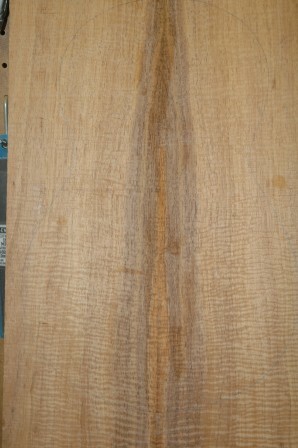 Some really fine koa for this uke. This is the top and back after joining. Detail of the top is shown. 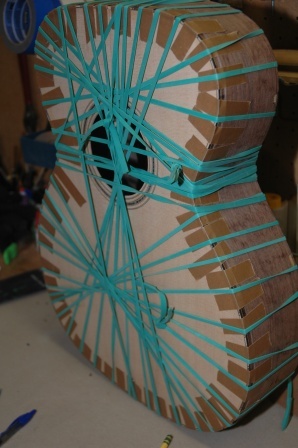 OK, it’s time to wrap up this guitar. I’m at that stage where I have to spend hours fairing and squaring the body: scraping the binding and back and sides to get them completely flush and all and any dried glue removed. 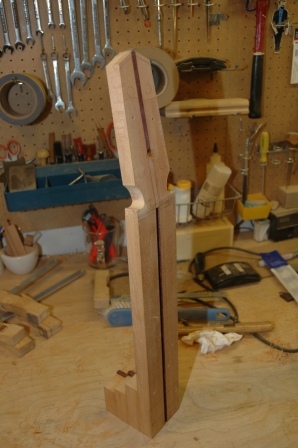 This is all the prelude to fitting the neck, which will need to have the tenon (or is it the mortise) shaped on the neck and angled properly to leave the neck flush with the top. Apprentice Devin is taking 3 weeks off to visit family and still needs around 30 hours of shop time to fulfill his apprentice hours. 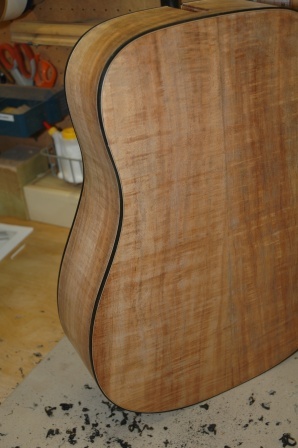 We’re making good progress and there should be enough time to finish this guitar in his remaining time. The purple heart we originally selected to use to bind the body is too brittle and came out of the bender unusable. We changed to ebony for binding, loaded it up in the bender and left to cool while we routed the channels for binding and purfling for the top. The purfling, a brown/black/white ladder was also bent along with the binding. It came out a wee bit wrinkled. This fiber laminate is probably best hand bent. We removed the wrinkled area and inserted a fresh piece which butts up invisibly.